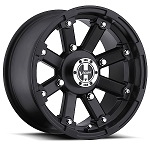 Our SS316 wheels are now offered in an all Black finish. ITP calls it the Black Ops. It's a matte black finish with a matte clear coat finish. Substance meets style with ITP’s all-new SS316. 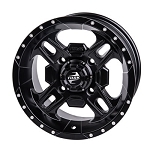 This lightweight, one-piece aluminum wheel possesses the style of a runway model but with the strength of a weightlifter. 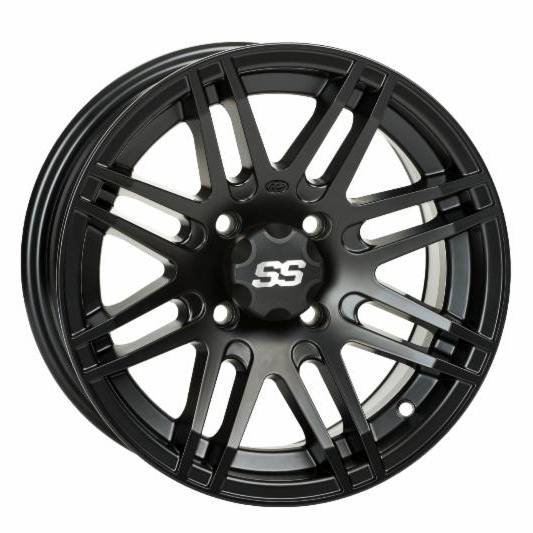 ITP’s SS Alloy wheel line has always been known for its stamina. It was the first in the industry to carry a lifetime structural warranty—you bend or break it, we replace it. Now that reputation will have even more regard, thanks to the SS316’s new reinforced Rock Armor inner wheel lip design. With Rock Armor construction, you can count on the SS316 to get you out and back again in style. The SS316 is so muscular that both the 12x7 and 14x7 sizes have an impressive 1000-lb. load rating, more than enough to meet the demands of today’s side-by-side UTVs and utility/4x4 ATVs alike. A custom SS™ center cap is comes with every wheel. Awesome wheels,improved the look of my stock Rhino big time! These rims look nice and hood for the money. Put myself in some pretty deep mud and they never scratched or anything. So far so good. I love em. Q: Will these fit my machine? I have a 2015 arctic cat xr 700 xt. A: Yes these will fit your machine. You just need to select the 4/115 bolt pattern.